A 5-year-old rescue horse jumps into frozen pond to save a young filly that had fallen through. 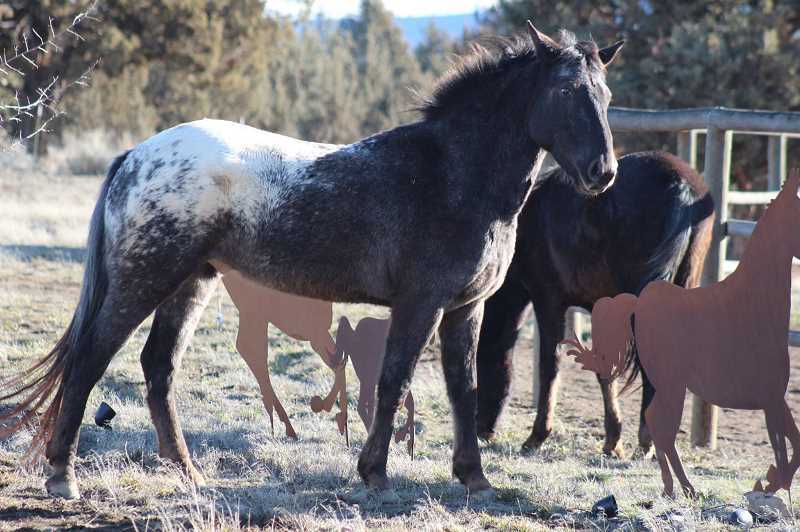 Seekseequa, a 5-year-old rescue horse from the Warm Springs Horse Network, also known as "Seiki," is now a bonafide horse hero. Last Thursday, Feb. 28, Heather Petersen, who owns Petersen Farms with her husband, Jake, was out on the farm with her 8-month-old and 2-year-old daughters, using a tractor to clear the access to their horse corrals and pasture, to reach their cows. 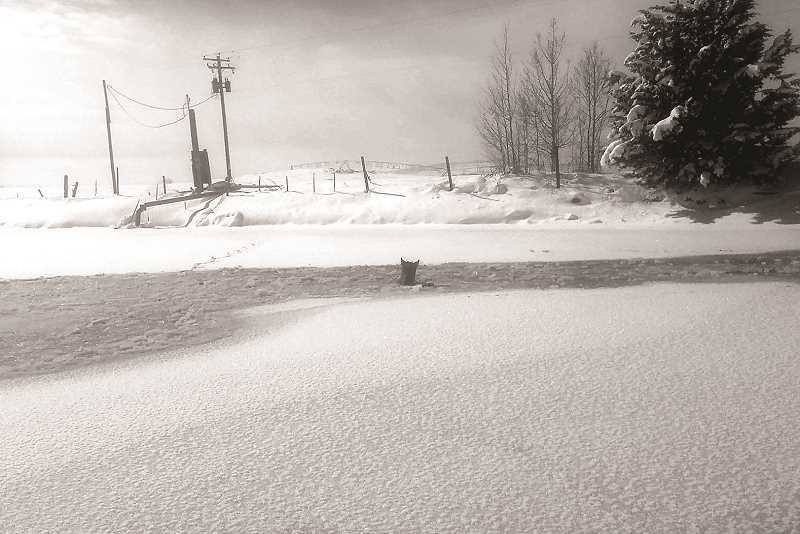 "As this snow began to accumulate, I chose to turn the horses loose in our 'pond pasture' because I could not keep the ice and snow out of the tanks at a reasonable rate," said Petersen, noting that nine of the horses on the farm, including Seiki, gathered near their irrigation pond, curious about what she was doing. In addition to Seiki, a mustang gelding that Heather Petersen is training for his owner, Beth Matanane, there were two other geldings, five mares, and a 10-month-old filly. Petersen recalled that the horses had gone to the corner of the pond to get a drink, when the filly, Ginger, began walking across the icy pond. "There is fresh snow on the 2-acre pond and no signs of tracks that would suggest any other horses have done this," said Petersen, who started to back down the driveway to get closer to call the filly back. "She gets about 60 feet out — roughly the center, and decides to turn back," said Petersen. "She had been walking about 15 feet from the bank and now she is heading diagonally — and to deeper water." 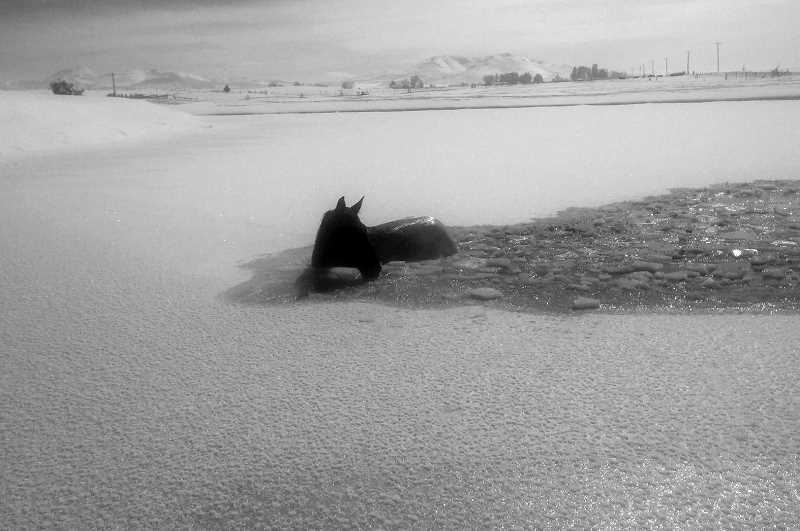 As Petersen was watching, the filly fell through the ice, straight into the icy water. "I shut off the tractor, placed the baby on the tractor floor, and started running to the pond; 2 feet of snow and such made it a little sloppy," said Petersen, who hurried to the corrals to get lead ropes and a halter. "It took me maybe three minutes to get to the bank and Ginger had not been able to break much ice. She broke free space around herself, but the water was over her back and she couldn't pull herself onto the ice." Petersen tried to step out, but the banks of the pond were breaking, so she onsidered her options. "Seiki and the mare were in the corner of the pond about 25 feet to my right — still looking at the filly, not moving or calling to her." As Petersen pulled off her coat and tossed it on the bank, she saw Seiki taking his first jump into the water. "He didn't walk out a few feet, or walk up and down the bank, he literally jumped in like he was going to clear a 6-foot gap," she said. "I yelled at him and cursed him for being so juvenile, then he kept going, throwing himself forward as hard and as far as he could with each leap." Seiki went straight to the filly's location, in about 10-12 leaps, she estimated, and then turned, as he reached the filly, and stared toward the east bank. From there, he made another five or so jumps back toward the bank, and stopped to look back at the filly. "He stood in the water, nearly up to his back, for three or four minutes, seemingly waiting for her, or gathering his strength," said Petersen. But Ginger wouldn't follow, and Seiki returned to shore, leaving two paths for the filly. "I had to ignore my good sense a bit and walk out to the filly," said Petersen, who realized that the filly had given up her fight, and was shaking and resting her head on the ice. "I was able to get a halter on her and work a rope around her little belly. With God's grace, I could pull on her each time she tried to jump up, and we made our way to the bank." Petersen was able to use the path made by Seiki to get the filly back to dry land. "She was scared and cold and resisted care, but I was able to get her in a corral, heaps of straw and several blankets on her, with warm water and mash." She also retrieved her two youngest daughters, who were safe inside the tractor. "Seiki came to the coral in an hour — completely dry! I threw a blanket on him, too, and he spent the next two days in a corral for observation," she said. When Matanane learned about her horse's heroics, she was impressed. "Seiki has always possessed and exhibited special qualities of intelligence, however, today he revealed a side of himself not short of a miracle," she said. "A miracle on the pond happened today at the Petersen Farms pond," Matanane added. "Animals who have that heightened will to survive are rare, special horses, who recognize danger, (and) take action to provide a path to survival." Matanane has nothing but praise for Petersen, as well. "She is a fabulous representation of women-owned and run business in Central Oregon." During weekdays in the winter, Petersen runs the hay and garlic farm, and cares for the Petersens' four children, while her husband drives a semitruck. At the time of the rescue, their two older children were in school. "(Petersen) has stood by WSHN (Warm Springs Horse Network) working with tiny foals to gentle them," said Matanane, praising her friend. "She has worked with older mares for us also, as in the case of 'Phoenix,' the Oregon Rescue Challenge horse 2018. She has a knowledgeable, gentle hand with them that gets results."